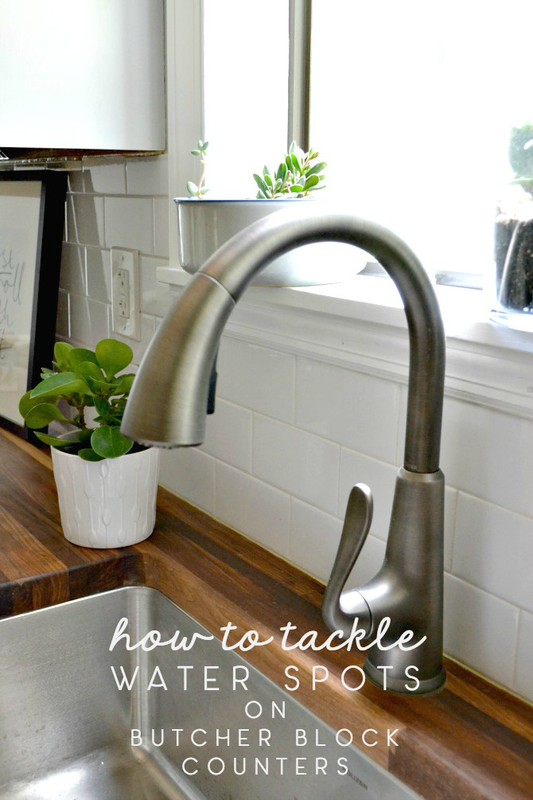 How I tackle tough water spots on my butcher block counters and rust spots on the undermount stainless sink. I’ve been asked a number of times recently what my favorite project is to date, and hands down, it’s still the kitchen (so far). 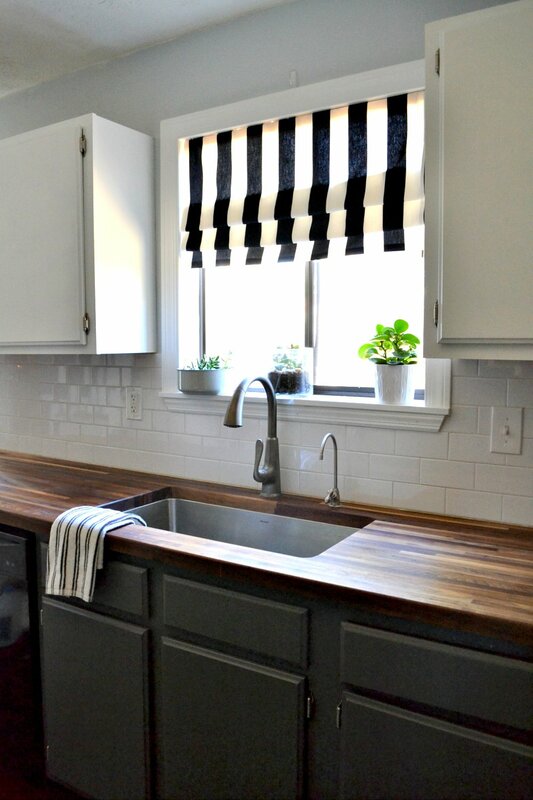 I especially love the area around the kitchen window: the striped window treatment, the sill for my succulents (one of the few spots in the house that gets a good amount of morning sun), the new faucet, and my ultra-deep undermount stainless sink. I am shamelessly proud of its transformation. 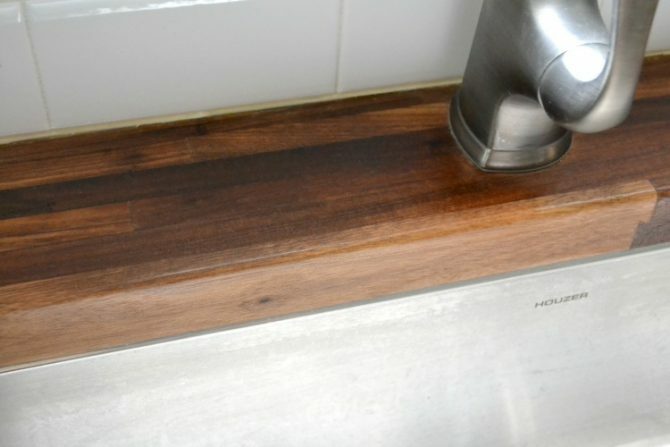 I already covered all the details about the faucet in a previous post here, but I also promised at the time to eventually share the details about the sink and answer some FAQs that come my way. 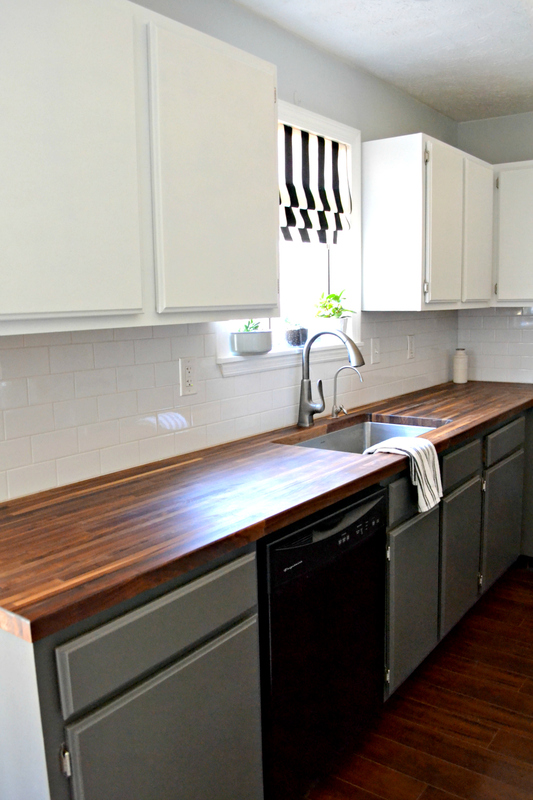 So, I’m back today to give you a little more detail and how I maintain the surrounding countertops. Now that I’ve been using this sink for a few years, I’ve gone through a little trial and error and found what works. The sink: it’s awesome. But in the below picture, it’s also dirty (I did that on purpose, just hold on a sec). 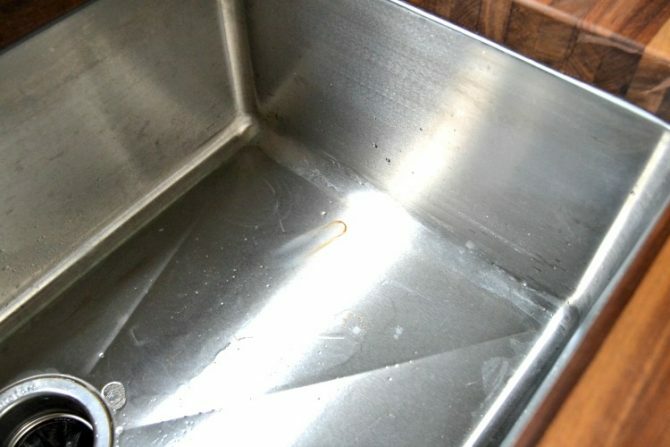 I had a beat up old double sink before, but one of the things I loved about this one was that it was a single basin and deep. It was given to me several years ago by a local company called National Builders Supply, now more simply known as Supply.com (they are based in Austell, GA, which is where I grew up). 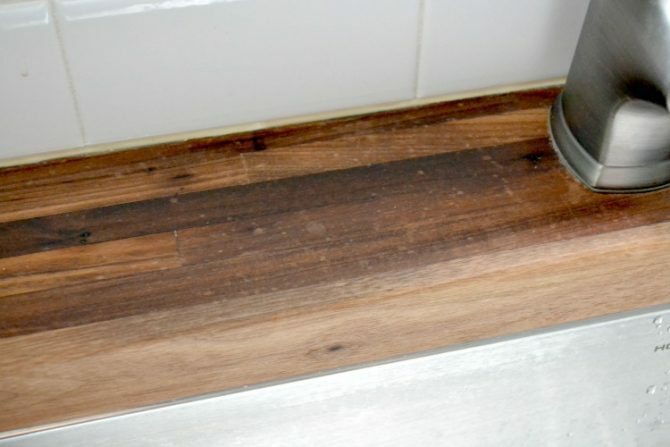 The sink under-mounts to the butcher block counters, which can pose two main issues: water splashing up and leaving spots on the surrounding lip of the counters, and rust stains in the sink (you can see one in the basin below on the right side). 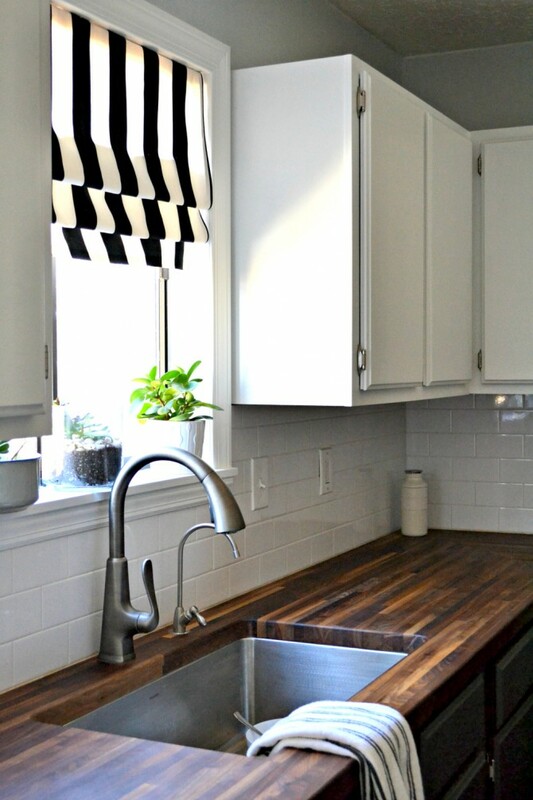 But hey, this blog is all about lessons learned in DIY; I wanted to share all about how I’ve gotten around these two problems and keep the sink area looking pristine. As you can see from the close-up photo below, these are those water spots I was talking about. 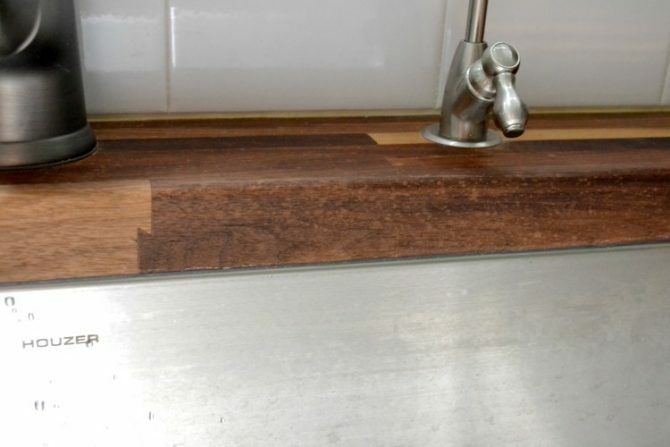 Usually, I’m pretty good about wiping the sink down if anything splashes out, but I’m also not the most diligent about oiling down the counter on a regular basis (I do it only every few months, tbh). 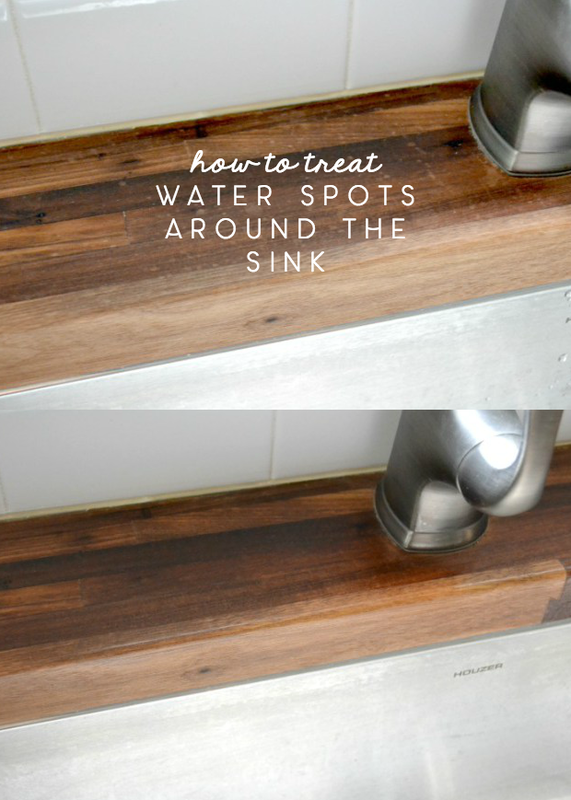 As a result, stray water spots form on the counter around the lip of the sink pretty easily. From day to day, this isn’t really all that bothersome, because you can’t really see it unless you get closer. Whenever I have wet hands or water plants along the window, I get little water spots like you see below. It’s normal for butcher block to show “character” over a few years of use, but this isn’t what I want! Luckily, there are two products that solve these issues for me every time. It probably goes without saying that when it comes to cleaning, I would rather literally haul rocks first. So I make every effort to find a product that does the work for as little effort as possible. 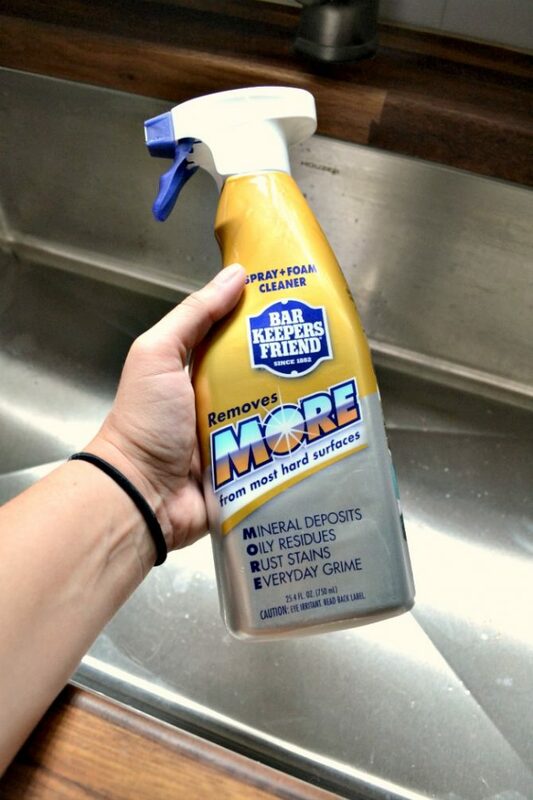 The solution that eventually worked for me is Bar Keepers Friend, which now comes in a convenient spray bottle. I just spray the foam on and let it sit for a few minutes, then use a little elbow grease. 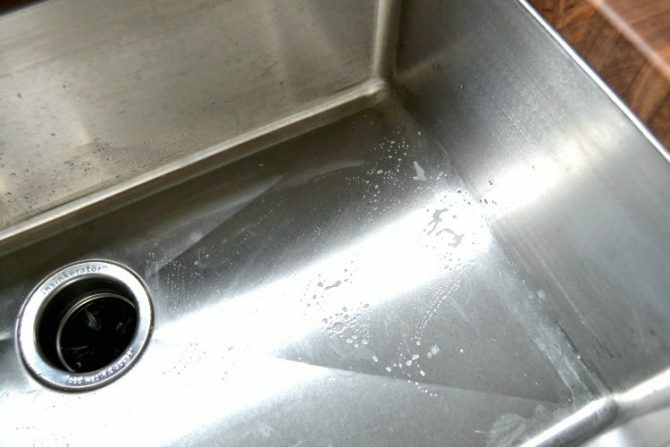 It removes rust marks, residues, water marks, old veggie grime, and anything else that falls into the sink. In no time, I have it polished to a nice shine. Then I can move on… to not cleaning the sink! End of story. I like to keep it non-toxic whenever I’m around things that might come into contact with food, so I prefer using Seventh Generation products to clean the counters. I use both their disinfecting all-purpose spray (and wipes) and wood cleaner (which I also use to clean the dining room table and other areas). 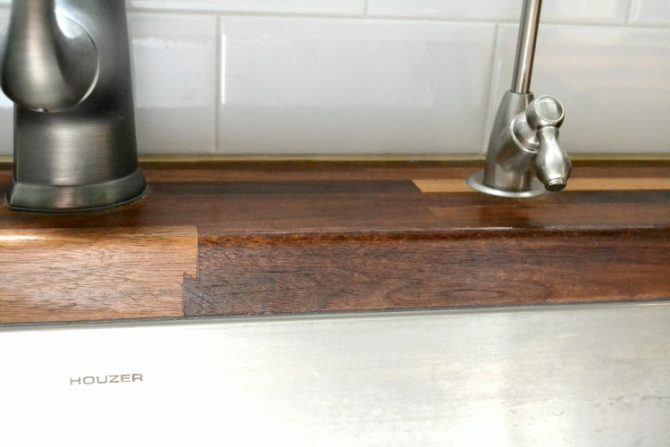 For water spots, I use the same exact oil and wax treatment that I’ve been using since I first installed the counters: Howard Butcher Block Conditioner. I’ll usually throw it in the microwave to nuke it for a few seconds to get the wax to flow out of the tube easier, but I apply it with either a little paper toweling or old t-shirt fabric (since it’s well-washed, it doesn’t produce lint). I slather the mixture on and let it soak into the wood, usually overnight. Anything else that doesn’t soak in by the morning, I wipe back off (to keep the surface from feeling gummy). Sometimes, it takes a couple of applications for spots to totally disappear, but they almost always do. For anything stubborn, I run a little bit of super fine sandpaper over it, clean off debris, and then oil. Works like a charm. As I mentioned, there was a mistake made when the hole for the sink was cut during its install; the blade bent out around the curve, cutting the underside of the corners a little too much. My uncle and I did our best to help hide it as much as possible (once I stopped freaking out, that is) by cutting a small sliver by hand, re-attaching with wood glue, and filling with a little walnut putty. Unfortunately, the color of the putty doesn’t really match the rest of the wood. Eventually, I might go back in and darken it a little. I really don’t notice it anymore. When you’re looking around the room, it’s pretty much invisible because it faces away from you. Plus, imperfections in butcher block are commonly filled with wood putty; this will only add to the character of the wood over time. I love that one small piece of the puzzle has been figured out! What’s your favorite feature in your kitchen? For more info on the kitchen makeover and progress to where we are now, check out the House Tour pages. 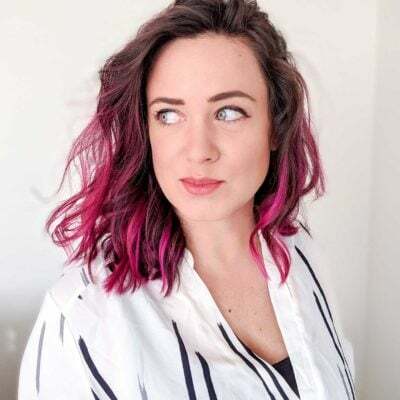 « DIY Courage Tonight & Speaking at the Haven Conference! Gee I didn’t know that Bartenders Friend came in liquid form. I truly love that stuff. I have Butcher Block on my island that is approximately 1 foot deep that I LOVE. 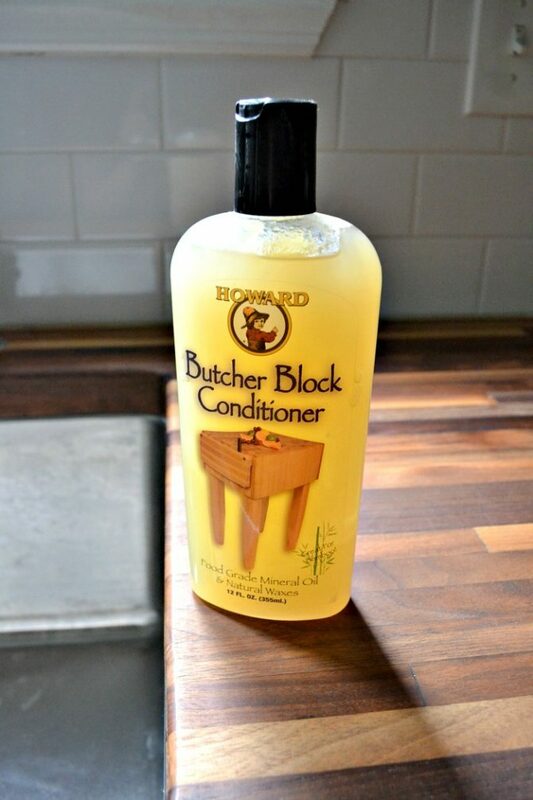 I will definitely look for for the Howard Butcher Block Conditioner. I just told my husband that I want a new sink that is deep. I have a twin stainless steel and I HATE it because it is very difficult to put my pans in. I am saving this to show my husband. Thanks. Glad it helped, Patty! I love having the single basin! Haha, I forgot about that one! I love your benchtops! 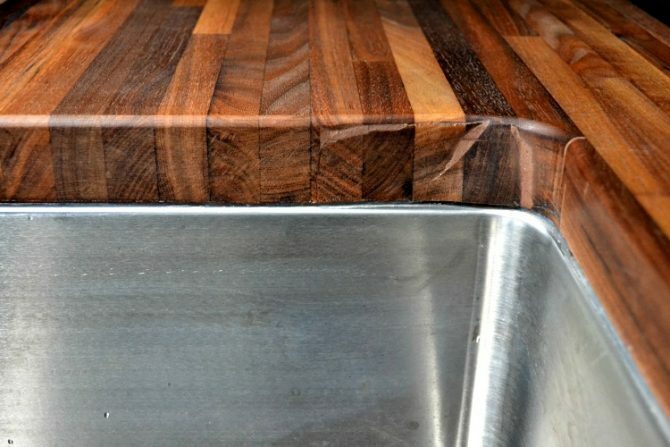 We have benchtops quite the same, and we use Tungsten Oil to keep them looking pretty. I am hesitant to use sandpaper on the spot one of the kids scribbled on with a pen, but one day I’ll take the plunge and get rid of it. Maybe! I also love your deep sink. I desperately wanted one for our new kitchen, but my husband doesn’t like them. He won there but I won elsewhere. All about compromise, right? I’m just not digging the side-drain space. It takes up so much bench space. But to answer your question, my favourite part of our kitchen is the acacia wood benchtops. When they’re not holding kitchen junk, and they’re all freshly oiled, they look bloody beautiful! Just like yours! I really, REALLY love the striped window treatments! And I totally understand the struggle with keeping a stainless steel sink clean. I use barkeeper’s friend but have the powder version — I didn’t realize it came as a spray. Duly noted! such beautiful counters and amazing sink. great cleaning tips, thanks! 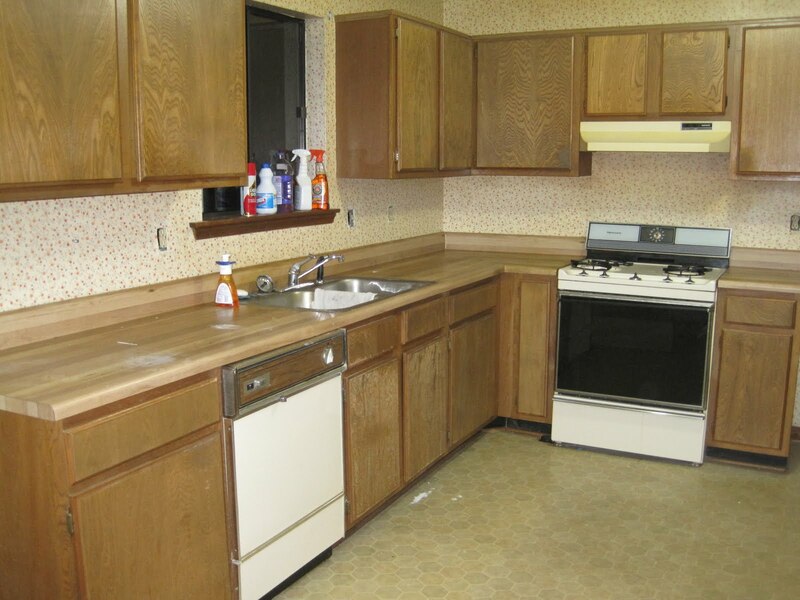 So what’s the verdict on the countertop now that some time has passed? Would you go that route again with the benefit of hindsight or go with another material? I am still smitten. No regrets for me, but the upkeep isn’t for everyone. 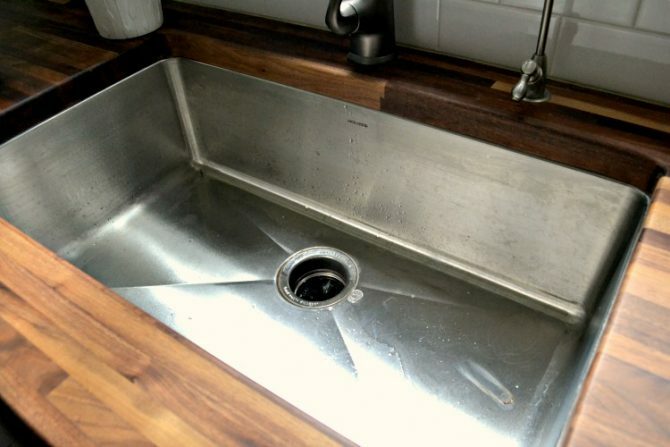 When I re-did my kitchen I went with a deep single sink as well! The divided sinks just make no sense for me. But I love how you paired yours with that awesome wood counter!!! So gorgeous. I really love the idea of your kitchen. It looks like exactly my dream kitchen. The sink under the window, beautiful wood counters and also those catus. I think I will upgrade my kitchen like your. Your kitchen looks so beautiful and luxurious. I love the deep single sink like that. Love the window too. I dream of having a kitchen like yours. The design looks gorgeous! When I makeover the kitchen, I intend to make double faucet and double sink so my I can help my mom with dish-washing. Do housework with the others is much more interesting than do it ourselves. I love the white tone too. It’s simple but looks luxurious as hell!! You really did a great job. I didn’t realize they had a butcher block conditioner. I have a old large (3×6) butcher block from when Woolworths shut down that I have been trying to decided what to do with for 20 years.. It looks like exactly my dream kitchen. The sink under the window, beautiful wood counters and also those catus. I think I will upgrade my kitchen like your. You have been my dream kitchen to a T. I am very envious of what you have been able to create. I love the greenery you have used, perfect finishing touch to a modern room!! Question for you! How does the Howard Butcher Block Conditioner feel when you run your hand over it after applying? Does it become completely dry/non greasy or waxy to the touch if given enough hours of drying time? Can you put a cookbook on the countertop without it becoming oily? Also wondering if the bottle says where the product is made? I have been looking all over their website and cannot find any information on where it is manufactured. Thanks for the help! It feels pretty oily/waxy when it goes on (since it’s just a simple natural oils mix). With a mix like this, there’s no such thing as “dry time” like you would have with a poly. It just soaks INTO the wood and the stuff that doesn’t is what you wipe off, similar to how you would care for a cutting board. That’s so that I know it’s food safe. I haven’t ever actually left paper goods on my counters for very long, so I can’t report that I’ve ever had something get ruined, but I do know that since it’s an oil it would definitely have some kind of small transfer if something was left for a long time. I let it soak overnight and then wipe in the morning and leave the counters as clear as I can. I buy mine off Amazon so the link in the post is provided for where I buy mine; hopefully that info says the manufacturing details you need!